The American Association of Orthodontics defines orthodontists as qualified dentists, who after graduating from dental school, go on to additional full-time university-based education in an accredited orthodontic residency program supervised by orthodontists. That training lasts at least two to three academic years—sometimes more. By learning about tooth movement (orthodontics) and guidance of facial development (dentofacial orthopedics), orthodontists are the uniquely educated experts in dentistry to straighten teeth and align jaws. The American Association of Orthodontics recommends a child’s first orthodontic visit by age 7. The first permanent molars and incisors have usually come in by that time and crossbites, crowding and other problems can be evaluated. When treatment is begun early, the orthodontist can guide the growth of the jaw and guide incoming permanent teeth. Early treatment can also regulate the width of the upper and lower dental arches, gain space for permanent teeth, avoid the need for permanent tooth extractions, reduce likelihood of impacted permanent teeth, correct thumb-sucking, and eliminate abnormal swallowing or speech problems. In other words, some early treatment can simplify later treatment. Orthodontic treatment can be successful at any age, and adults especially appreciate the benefits of a beautiful smile. One of every five patients in orthodontic treatment is over 21. 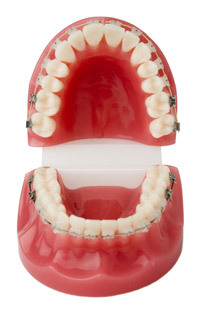 Many adults seek orthodontic treatment not for aesthetic purposes only, but to improve the function of their bite. Adult orthodontics are more convenient and comfortable than ever due to the technological advances like Invisalign and clear braces. After these orthodontic records are obtained, a treatment explanation and financial consultation will be made. Our office works closely with your dentist to ensure that you achieve your ideal smile. We maintain open communication so that he/she is informed about your care. It is extremely important that you continue to visit your family dentist regularly for routine dental care.